The man came from the United States. 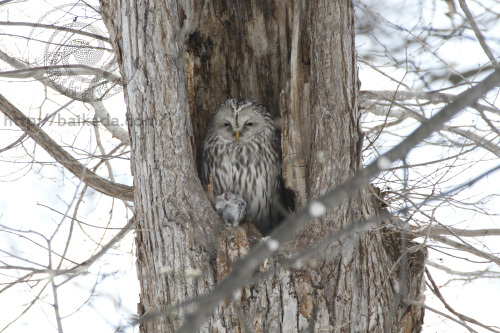 Because he wanted to see the owl in Hokkaido, I guided him to the place where it seemed to be able to see the owl. I took the photograph because there was an owl that had a strange foot though I did not take the photograph in the place in which the person gathered too much. Because he injures a leg, does the hollow put out a leg? Or will there be a tumor in his leg circumference? I was worried about it to me very much. He did not move the leg all the time after all. The corpse of the animal is slightly bigger, and the following photographs come out. The person who cannot look please refrain from reading. I came back to the house and I enlarged a photograph and understood. The owl held a small animal solidly. Judging from a hair color and size, the small animal seems to be reliable in Russian Flying Squirrel. Because there are the testicles, it is male. The upper part of a body of the flying squirrel seems to have been already edible. I heard it from an American, but it is said that the kind of the owl stocks the flying squirrel which was not able to eat at hand. 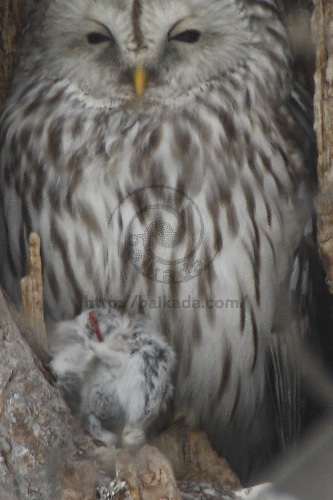 This owl may have stocked the flying squirrel which he hunted during night. When I was really interesting, I showed that I confirmed an owl with an American.